You notice some discarded wings near your window. But, you have ignored the sight. After a month, you get the news from your neighborhood that your house is under threat of termite infestation. Do you know how to deal with the infestation issue? Seek help from our trained professionals to erase the presence of termites from your home now and forever. How much you know about termites? You notice a heap of wooden dust under the dining table. You overlook the sight in the beginning. After some days, you notice some discarded wings and a hole on one side of the table. Upon looking through the hole carefully, you come to know that termites have nested in your furniture item. When people talk of a wood-eating insect, the only name that strikes in your mind is of a termite. It is true that termites can consume all the wooden stuffs of your place. It is natural to think termites look like ants because of its shape and size. You should know termites are far beyond than ants in terms of appearance and other social habits. Just like all insects, termites too form a colony. The king and queen of termites look after the colony. The soldier termites protect the colony from their enemies. 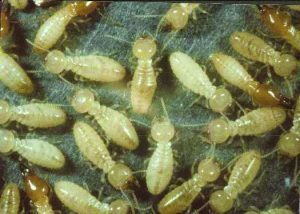 The prime job of worker termites is to provide food to the colony and do the work of destruction in people’s homes by destroying the structures and agricultural lands. Coming to the appearance, termites are white in color with tiny legs. The body of a termite appears to be soft. The size of a termite would be 1cm in length. Not all termites have wings. Termites have mouthparts which help them chew items. It is necessary to eradicate termites as soon as you spot them in your house. To avoid severe termite problems, you should take action in advance by treating your place with our termites control services. Do termites affect the health of humans? Termites do not pose a health risk in human beings. Termites do not have a tendency of biting when these insects are attacked by humans. Upon being threatened by a person, only the soldier termites have a tendency to sting a human being. The reaction of the stings could be swell and pain around the biting site. The nest of termites contains dust particles which are harmful for people who have asthma and allergies. How will you know that your home has termites? It happens many a time that homeowners cannot detect the presence of termites unless and until they spot some serious damage in their homes. Serious destruction takes place when you happen to see a full-blown infestation of termites. Some initial signs are as follows. You can hear humming sounds like bees inside the items or in the walls. The infested objects will emit hollow sounds upon being tapped on them. A large number of discarded wings can be seen on the floor. Mud tunnels are formed in the foundation of your residence. 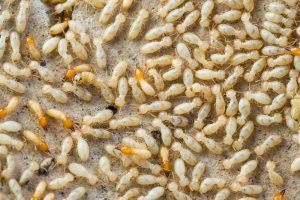 Know more about the infestation signs from our termites control Brisbane pest guys. Several termite species move around your house. You should never use termite-related pesticides on the infested points without having a precise knowledge on termite species. At the time of implementing our termites treatment Brisbane solutions at your place, our pest officers will tell you all about the termite species such as formosan termites, subterranean termites, dampwood termites, dessert termites and drywood termites which are constantly active in your surrounding zone. Not all termite species look alike or have same social habits. Therefore, you should gain thorough idea on every termite specie which will help safeguard your home in future. Is it possible to do kill termites by using my techniques? As you do not have sufficient knowledge on termites, taking up extermination process by yourself would not be a smart job. You might be titillated to eradicate termites from your place. The local pest products will solve your termite problem for the time being. You will again have to deal with termite infestation issue in the long run, if you do not appoint a professional pest controller. Getting shot of termites from our trained termites control Brisbane professionals will prove to be fruitful for you. Only the experts know how to eliminate the infestation. By using their professional skills, our pest control guys will eradicate the breeding sites of termites in an effective way. Whether your home has a small or large number of termites, our pest officers will put a halt to the existing termite invasion. All our pesticides are tested and approved from trusted green organizations. We always use eco-friendly pest products, so that your home or your commercial property remains safe from the toxic effects of pest chemicals. How we will eradicate the issue? Our termites treatment Brisbane plans have proved to be effectual. 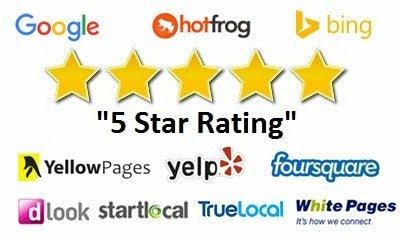 Our clients are very happy with the services rendered by us. We execute termite solutions by assessing indoor and outdoor places. No areas of your indoor and outdoor zones will be left out. Our pest officers will then use dust sprays on the tricky places where termites tend to breed more. In times of critical situation, specialized surface sprays might be used for eradicating the creepy insects from troublesome spots. Upon inspecting all the places properly, our pest guys will use correct amount of pesticides required for termite eradication. It will not be possible to eliminate all termites at once. Therefore, our pest servicemen will make constant visits at your place to apply termiticides. How much you need to pay for receiving our treatment? If you are thinking you might have to break your bank, then you are thinking wrong. Our termites control services can be provided to all our customers of Brisbane and the nearby vicinity at the cost-effective rates. We do not charge hidden costs from our customers. Hence, you can be certain of paying the right price for our pest solutions.